Pastor Tim gives a word of encouragement to those of us who know that Jesus Christ is Lord. This entry was posted in Christian Values and tagged "Watering the seed" on February 28, 2013 by Shayn Roby. This entry was posted in Government Tyranny, Liberal Zombies and tagged "Anti-Semitism", "Ellison", "Farrakhan" on February 28, 2013 by Shayn Roby. This entry was posted in Government Tyranny, Liberal Media Bias, Liberal Zombies and tagged "Obamagate" on February 28, 2013 by Shayn Roby. Bob Woodward: “Senior White House Official” Said,”You will regret doing this!”. It looks as though Obama may just have his “gate” before he leaves office. Time will tell. It appears when Mr. Woodward called Obama on his lie about saying Republicans were responsible for sequestration (Obama’s creation: historical fact), ObamaNation (or Abomination) tried to intimidate Mr. Woodward. This entry was posted in Government Tyranny, Liberal Media Bias, Liberal Zombies and tagged "Bob Woodward", "Gene Sperling", "Obama Blame Game", "Obama Thuggery", "Obamagate", "Sequestration" on February 28, 2013 by Shayn Roby. 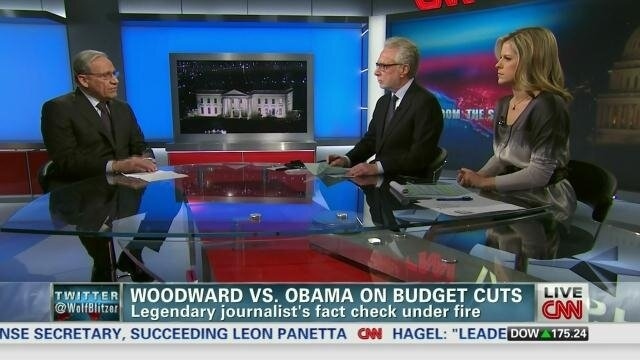 According to the political ticker at CNN.com, Veteran journalist Bob Woodward said Wednesday he was threatened by a senior Obama administration official following his reporting on the White House’s handling of the forced federal spending cuts set to take effect on Friday. You can see the interview in its entirety at http://politicalticker.blogs.cnn.com/2013/02/27/bob-woodward-says-he-was-threatened-by-white-house/ . Journalist Bob Woodward of Watergate fame says a “Senior White House Official” threatened him. This entry was posted in Government Tyranny, Liberal Media Bias, Liberal Zombies and tagged "Obama Thuggery", "Obamagate", "Threat to Bob Woodward", "Watergate" on February 28, 2013 by Shayn Roby. According to Madeleine Morgenstern at The Blaze, students at a high school in McAllen, Texas were required to recite the Mexican pledge of allegiance as an assignment for a Spanish class in McAllen, Texas. Jonathon Seidl’s article at The Blaze quoted 15-year-old Brenda Brinsdon as saying, ““I feel that this was an indoctrination,”. You can see video of the pledge being recited along with Brinsdon’s interview on Fox in Seidl’s article at The Blaze. This entry was posted in Government Tyranny, Liberal Media Bias, Liberal Zombies and tagged "Foreign Indoctrination", "Required Recitation of Mexican Pledge of Allegience" on February 27, 2013 by Shayn Roby. This entry was posted in Government Tyranny, Liberal Zombies and tagged "Chuck Hagel", "Louis Farrakhan" on February 27, 2013 by Shayn Roby.